I have before me two tomes. The longer one is a somewhat rushed and tedious product whose guiding ideological vision and fuzzy presentation of crucial details repelled independent voters the last time it was put to an electoral test. The second document is somewhat more succinct and engaging but remains open to criticism for its embarrassingly padded margins and large print that makes it seem so much longer than it actually is. I'll leave you to guess which one is Sarah Palin's memoir and which is the Senate health reform bill. If you listen to Republicans, they oppose that Senate bill because it is a Rube Goldberg contraption that is just too complicated, too opaque, and fills too many pages. Yesterday, Lamar Alexander gave full voice to this objection speaking with Ezra Klein: "One thing is you can’t be sure what’s in the Senate bill because it's 2,100 pages long. You just know there are surprises in it." He may have good reasons to oppose the Senate bill, but I'm pretty sure that its length and complexity are not his real beef. 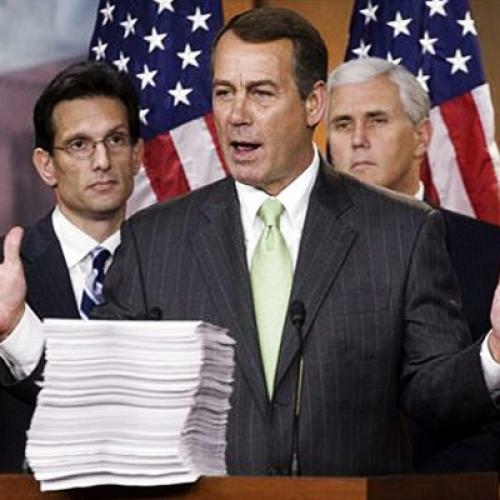 Congress routinely passes cinder-block-sized tomes that could provide valuable armor plating for tanks headed to Iraq. Politicians who say that they oppose a bill because it's too long and complicated are generally fibbing. The only mystery becomes: What are they really thinking? In like fashion, a politician who says that she opposes something because it amounts to large-scale social engineering is more likely to believe what she is saying, but she is still telling an untruth. No doubt about it; health reform is ambitious social engineering. So was welfare reform. So were Reagan and Bush (43) tax cuts. So was No Child Left Behind. So was knocking down high-rise public housing here in Chicago. Privatizing Social Security and converting Medicare to vouchers (two favorite Republican ideas) are huge and messy social engineering projects, too. As Ezra rightly noted, Senator Alexander's answer is doubly implausible because the Senator co-sponsored the Wyden-Bennett plan—a markedly more radical social engineering project than the current Senate bill. To remind casual readers, Wyden-Bennett would have achieved universal coverage by imposing an individual mandate, establishing state purchasing pools that would offer community-rated coverage comparable to the basic plan offered to federal employees. Families below 400 percent of the poverty line would have received income-linked subsidies to make insurance affordable. Oh yeah. Wyden-Bennett would have replaced Medicaid and SCHIP with a new program that supplements private coverage. In case these provisions were politically imaginable, the bill would also have eliminated most of the current favorable tax treatment of employer-provided health coverage. Asked to explain how he could support so many of the above concepts before he opposed them in the current Senate bill, Alexander only dug himself in deeper: "The Wyden-Bennett bill was simpler, with fewer surprises, and more straightforward. I liked it because it was bipartisan. I wouldn’t have voted for it." If brevity, simplicity, and no-surprises were the sole criteria in health reform, the House and Senate health reform bills would have been cast aside long ago. So would Republican alternatives. As John Conyers would be only too happy to note, the simplest, shortest, and perhaps most predictable bill would say the following: "Every American citizen is henceforth entitled to enroll in Medicare." This single-payer system is politically infeasible. It mobilizes decisive ideological and interest-group opposition, not because it requires phone-book legislation or because it is too complicated. Virtually everyone in America understands what Medicare-for-all means and how it would work. A government agency has been doing that job for 40 years. Given the choice between a straightforward single-payer system and our current incomprehensible but lucrative patchwork of public and private payers, virtually the entire supply-side of the medical economy would opt for Rube Goldberg every time. Ironically, the parts of the Senate bill anathema to Republicans are neither long nor complicated. Republicans oppose proposed cuts in the rate of growth in Medicare spending, the large affordability credits to poor and working families, not to mention the House bill's public option and its proposed progressive tax increases on the wealthy. The main matters of partisan dispute can be explained in a few tables and maybe 20 pages of text. Most of the junk DNA of the Senate bill is the usual block-and-tackle of complicated legislation, and is of no particular ideological or partisan concern. Many of the Senate bill's 2,000 pages concern proposed delivery reforms and other measures that are widely supported by policy wonks across the political spectrum, including those in the recently-departed Bush administration. There's a lot of complex detail to get right. Once this bill is passed, there may be opportunities for bipartisan problem-solving with moderate Republicans such as Alexander; not now. It’s a charade (though perhaps a useful one) to pretend otherwise. Watching the immigration bill and cap-and-trade and health care all fall beneath their own weight, I’ve come to believe we need to go step by step. On health care, I think that means just doing cost. Bills rarely fall of their own weight. Most are pushed over the edge by politicians who have their own reasons to see them dead. Republicans oppose health reform because it is an expansion of activist government, and because it is the politically vulnerable signature domestic policy achievement of the Obama administration. It's that simple. If one believes that 30 million people need health insurance now, rather on the model of the original Wyden-Bennett bill, we can't wait.